Hello! My name is Alex, and I’m currently attending the Urban School of San Francisco. I’ve always loved building and being creative, but I never tried coding and robotics. Bluestamp has given me an excellent chance to expand my knowledge on these subjects. To make it work, I needed to redesign the chassis and make my own 3d printed case. I came to BlueStamp knowing very little about electronics, robotics, and 3d modeling. After only 6 weeks, I know much so much more than I even thought I would. I’ve been seriously considering engineering as a career path, but I’ve never had that much experience with its different branches. BlueStamp was the perfect opportunity to learn more about both engineering and my interests. The front of the case, complete with 8 lit LEDs. The back of the case, with a small hole in the back to fit the power switch. My finished product is a wirelessly controlled RC car. It features a 3d printed case that I personally designed to match the above image (more on that in the section below). 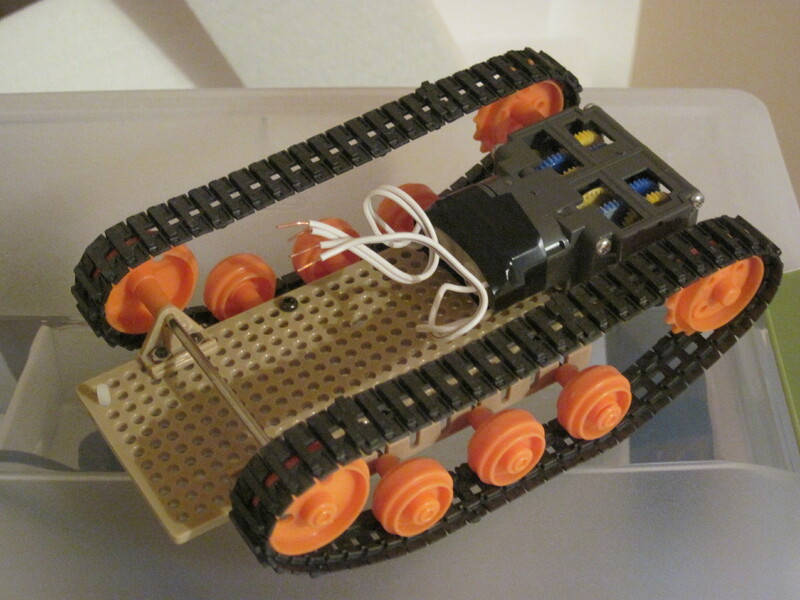 The RC Tank Mk.2 is controlled using a wireless PlayStation 2 controller, which is useful because each signal output on the receiver is divided into separate pins that are easy to hook up to an Arduino. It has entirely custom code based on the PS2X library and the Adafruit motor shield library for Arduino. An Arduino library is a set of code that is used to detect and recognize things like motors and controllers, as well as adding custom commands and variables. This allowed my code to detect inputs from the PS2 controller and power my motors. Finally, My RC tank features 8 LEDs and a small speaker to make it more accurate to the ingame model. I have three important iterations of my code, each more complicated than the last. The first iteration used the four directional buttons on the left of the controller, which was simpler and faster to code but very rudimentary. The second iteration used the joystick controls instead, making piloting the RC tank easier and more responsive. The third and final iteration implemented the chirp function, which, when the triangle button is pressed, makes the LEDs blink twice and makes the speaker emit two tones. I modeled everything in SketchUp, a 3d modeling program, and then exported my designs into .stl files for 3d printing. You can find both the .skp and .stl file here. This is a comprehensive list of everything I used to create my project. Also included are the various tools needed to make it work. Each piece is precisely measured to fit the chassis correctly, and when I actually ended up printing, they fit perfectly without any modification. The top has many separate pieces because, in the full design, each piece has a different color. If I were to print it all as one segment, it would be extremely difficult to individually color each piece. Firstly, the long individual tube is meant to represent the shiny metal gas canisters on the top of the model. The four squished cylinders are the blue section on the top, which appears to be some sort of battery with a stretched blue plastic on the outside. SketchUp doesn’t appear to be able to model anything like stretched plastic, I plan on printing this piece and then stretching a blue plastic material over it myself, to recreate the effect. Finally, there’s the front section with 8 holes in it, which I used to fit in the LEDs I added. I had to print this separately because when attached it falls below the top of the case, meaning that I would have to either print upside down or with many support structures. Either of those methods would be less efficient than simply printing the piece separately. My entire project was essentially a modification of the main design. I really couldn’t use the guide much at all because my chassis and code were completely different. My RC car uses custom code based on the motor shield and ps2 controller libraries and a custom designed and printed case, giving it a completely unique look and feel. Instead of directional pad inputs, my car has each joystick controlling each wheel independently, allowing for quick speed adjustment. Finally, I added a small speaker and 8 LED lights to my RC car. The lights remain on, but when I press a button on my controller they flash and the speaker emits a little beep, just to add a fun element to the RC car. This system was surprisingly difficult to implement simply because of how much wiring it takes to power LEDs from an Arduino, adding quite a bit of clutter to the chassis, though it’s not visible from the outside. The modeling was one of the most challenging parts of my project because I had to design it all by hand, using only two grainy screenshots and the measurements of my chassis to guide me. Between modeling issues and 3d printer errors, modeling took at least 2 and a half weeks to finally finish. Some pieces need to be colored separately, so the top of the case is missing most of its parts. I have many things I would like to do to make the model look better (my modifications are mostly aesthetic after all), time constraints and lack of printing material has stopped me from doing so. I also rewrote the code so that the wheels are independently controlled by each joystick on my controller. I have finished the coding of my RC car and it responds perfectly to my controller inputs. Currently, I’m using the four directional buttons to move the car left, right, forwards, and backwards because it is a little easier to code, and I may change that in the future to have each wheel independently controlled by the joysticks on the controller. My code, while fairly simple, is built on top of more complicated code that detects connected devices and adds its own commands and variables to the basic systems pre-built into the Arduino. This is called a library, and I use two of them. One is for the motors, and it detects and sets up the arduino to power the motor shield. The other is detects the inputs of my controller from the receiver. As a side note, I’ve replaced the 9 volt battery with a longer lasting 7.4 volt lithium ion battery. Because this is much harder to remove from the Arduino to power off, I’ve also added a power switch. I have also replaced the motors with ones that have more torque and can withstand a higher voltage. My starter project was a basic theremin made by MadLab, found here. It operates using an aerial and one’s hand as a capacitor. The distance changes the capacitance, which is detected by the microprocessors which decide the note to play and the LED to light up.